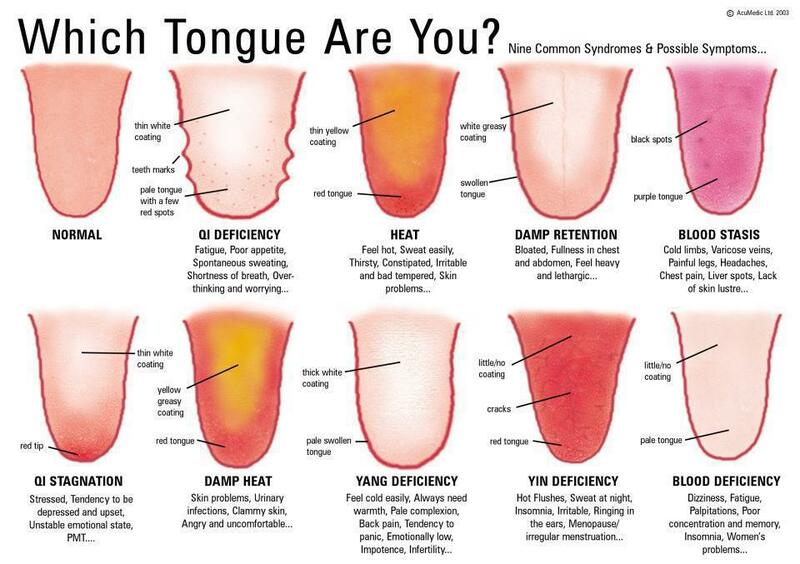 My community acupuncture patients sometimes ask me what I see when I look at their tongues. Among the ways acupuncturists can diagnose illness in the body is by examining the size, shape, color, coating, markings, and blood vessels on the tongue. Just by looking at the tongue, we can gain a multitude of insights about symptoms and underlying ailments. What are some of the things the tongue tells us about a patient? On the tongue, we can see if a patient is stressed, fatigued, or didn’t get enough sleep the previous night. We can see if a patient is experiencing pain, respiratory issues, digestive problems, menopause, high blood pressure. We can see if a patient is about to have a stroke. We can see if a patient has cancer. All this and much more is indicated by a person’s tongue. Occasionally, a patient asks what they can do to make their tongue normal. Since the tongue merely reflects the condition of the body interior, the way to achieve a healthy-looking tongue that is uniformly light pink, not too big, not too small, and covered with a thin clear-white coating is to take care of your body! Lounging with needles in our acupuncture studio on a regular basis is one of the best things you can do to bring your whole body, mind, and spirit into a healthy balance. Regular acupuncture — be it semi-weekly, weekly, monthly, or bi-monthly depending on your state of health — can “fix” a lot of imbalanced energies in the body to reduce stress, diminish pain, regulate your hormones, regulate your sleep, improve mental processes, normalize your digestive system, normalize your blood pressure, put an end to migraines and allergy symptoms, curb your cravings for whatever it is you crave, calm your nerves, improve your emotional state, and boost your energy. Acupuncture can even get rid of bad dreams and keep your mind from racing. The amount of things those tiny “invisible”acupuncture points can do to help you wear a healthy-looking tongue is immense. Your acupuncturist can also give you advice on nutrition and exercise to improve your “tongue health”. We can also prescribe natural herbal supplements which work well with acupuncture to help you achieve desired results in your health.